I am a big fan of rose-scented products. Despite not normally being a floral kind of girl, there's something about rose smells that just seems lovely and fresh but also has that girly edge. Case in point: my current perfume, Dolce & Gabbana Rose The One, which has the most beautiful rose smell in an almost 'clean' way and which I absolutely adore. But today's post is about skincare rather than perfume, and more specifically about Superfacialist Rose Hydrat Calming Cleanser. For those who may not know, Superfacialist is the skincare brand from Una Brennan, whose facials are legendary amongst London's beauty elite. It currently comes in two collections - the Rose line, which is aimed more at dry and dehydrated skin, and the Neroli line which is more for combination and oily skin. The main selling point of both ranges is that they're made with lots of natural ingredients that are good for your skin; for example, this cleanser has shea butter and cocoa butter to moisturise and marshmallow and allantoin which work to soothe and balance the skin and stop it drying out. 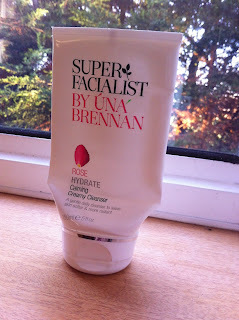 I'd also heard good things about the Superfacialist range from Sali Hughes, the Guardian's beauty writer who is a bit of a hero of mine, and as my skin has been feeling a bit drier in the cold weather I thought I'd give this cleanser a whirl to help restore some of the moisture. The consistency of the product is that it's very creamy and rich but not too thick, as you can see in this swatch on my hand. 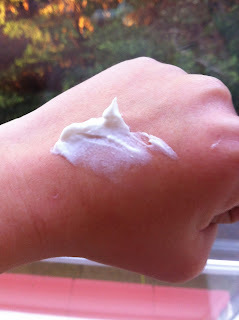 It spreads quite easily when applied to the skin too, although I find I need quite a lot - perhaps about the size of a 50p piece to lift off all my make-up. Equally though I feel like it's lasted a long time; I bought this at the end of September and it's still going in mid-December! Finally, it smells absolutely amazing, with a real true rose scent which adds to the luxurious feeling, but I'd expect nothing less from a product with rose absolute in it. Overall I really like this cleanser - it's lovely and rich which makes ideal for the winter months, takes off make-up really well, isn't too heavy and smells absolutely gorgeous. Definitely a favourite in my book and one I'll hopefully return to next winter or if we go through a particularly cold patch again. If you'd like to try this cleanser it's available at Boots, where a 150ml tube will set you back £7.99.